Dating groundwater is something that hydrogeologists like to do for different practical purposes. Conceptual modeling of aquifers, evaluating the sustainability of groundwater exploitation in arid and semi-arid areas, sitting a deep geological repository for radioactive waste are obvious examples where groundwater residence time becomes crucial. In this post I will show a summary of our recent paper at Journal of Hydrology (Trinchero et al. 2014). Helium originates mainly from three sources: the atmosphere, the mantle and as a result of radioactive decay processes taking place in the crust. Each source of helium is characterized by a particular 3He/4He ratio. The isotopic composition of helium in the atmosphere is characterized by a 3He/4He ratio of about 1.4x10-6. Radiogenic helium is primarily 4He, with a 3He/4He ratio in the terrestrial rocks closer to 10-8, and primordial helium in the deep earth is enriched in 3He with a variable isotopic composition (from 1.1x10-5 in the upper mantle to 8.7x10-5 in the lower one). Helium in the crust originates from the alpha decay of natural uranium and thorium series, whereas 3He is formed by thermal neutron capture by 6Li. Helium production in the crust is dominated by the alpha decay of the uranium and thorium decay chains, and therefore directly proportional to the concentration of 235,238U and 232Th in the rocks. where r is the rock bulk density (kg/m3), Vm the molar volume of the gas (m3/mol) and [U] and [Th] are the uranium and thorium contents of the rock matrix (ppm), respectively. Then, if we know (measure) the concentration of dissolved helium in a groundwater sample, we can estimate how much time this water had (theoretically) been in contact with the rock to reach such Helium content. But this is assuming all the Helium comes from radiogenic origin without mantelic and/or atmospheric contribution. And also assuming a closed 0-dimensional system, i.e. no diffusive transport of Helium occurs in the rock porewater. where du is the depth of the “shallow” aquifer with rapid groundwater renewal (and we assume the production of he is negligible), and dl is the maximum depth of the rock unit containing [U] and [Th]. It is worth noting that we adopt this “discretization” to mimic the application example shown below, but it can be changed or extended to any other settings. Olkiluoto is the site where POSIVA (the finish company for nuclear spent fuel management) is conducting field investigations to evaluate the suitability of constructing an underground facility to dispose high-level radioactive waste. Olkiluoto is located on the coast of Gulf of Bothnia in south-western Finland. The two main lithological units of the Olkiluoto site are (1) high grade metamorphic rocks and (2) igneous rocks. Hydrogeological and geochemical investigations shows that the site has a “shallow” part (from surface to about 250 meters) with active hydrogeological circulation, and a deeper zone with groundwater movement is much lower and limited to some water conducting fracture zones. Radiogenic helium production at Olkiluoto is related with the presence of granites in the bedrock. Recent seismic studies have suggested that in the Olkiluoto area, different granites extend to a depth of at least 4 km. Thus, we have considered two models, one where a constant production rate is applied from the upper boundary (which is located at 250 m depth, after the zone with more active hydrogeological circulation) down to 4000 m depth, and the second where in situ production is present only in the first 1000 m of bedrock. A deep source of helium (J0), which mimics deep-seated granite production, is located at the bottom of the domain. The Uranium and Thorium contents of the rock are well known, as well as diffusion coefficients and porosities. Then, we did a fitting exercise by calibrating the groundwater residence time, tr and the deep source of helium, J0. 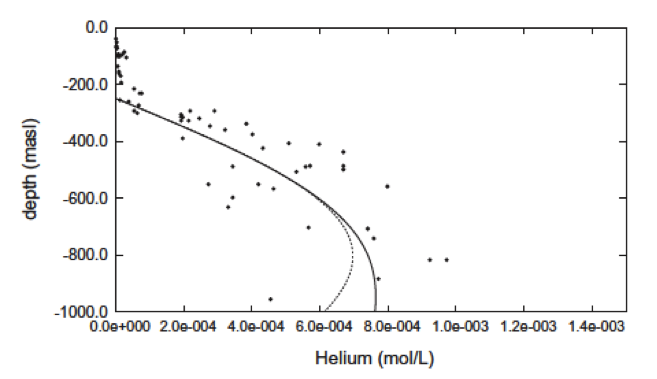 Both models were able to fit very well the Helium concentrations measured in the field, as shown in the next figure (dots are field measurements and lines are the calibrated models). Comparison among measured Helium concentrations and the best fit calibration with the new analytical solution. The fitting parameters are the residence time of groundwater and the Helium flux at the bottom boundary. The resulting fitted parameters are the same for 2 models, which indicates that extending the Helium production deeper than 1 kilometer is not too sensitive. The best fit was obtained for a tr (residence time) of 3.2x107y, and J0 (Helium flux from the mantle) of 3.1x10-9 mol/m2.y. So far we do not have data about Helium isotopic ratios in the groundwater. Future determinations of such isotopes could help us to quantify the mantelic contribution and then test the validity (or at least the degree of confidence) about our estimation of 30 million years of residence time for the groundwater in the granitic rocks of Olkiluoto. Jorge Molinero is a geologist with a Major in Hydrogeology and a PhD in Civil Engineering. Jorge has been working with coupled multiphysics and geochemistry challenges in the last 20 years. Nowadays, he is the Scientific and Technical Director of Amphos 21 Consulting [http://www.amphos21.com/vistas/], a firm providing global services to the Nuclear, Mining, Oil and Gas, and Water Resources industries and authorities. I would like to acknowledge to all my coauthors of this paper. It was a great project and I think we all enjoy very much working together. Paolo Trinchero was the leader of the project at that time, together with Anne Delos who worked very hard in the first stages. Marco Dentz was the one really behind the maths for the analytical solution and Petteri Pitkanen provided the best expertise for Olkiluoto geological settings and the behavior of dissolved gasses in the groundwater. 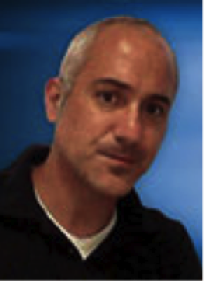 Ignasi Puigdomenech (SKB) was also a key person for this project, and provided high level comments and constructive suggestions to the first versions of the report and paper. Trinchero, P.; Delos, A.; Molinero, J.; Dentz, M. & Pitkanen, P. (2014). 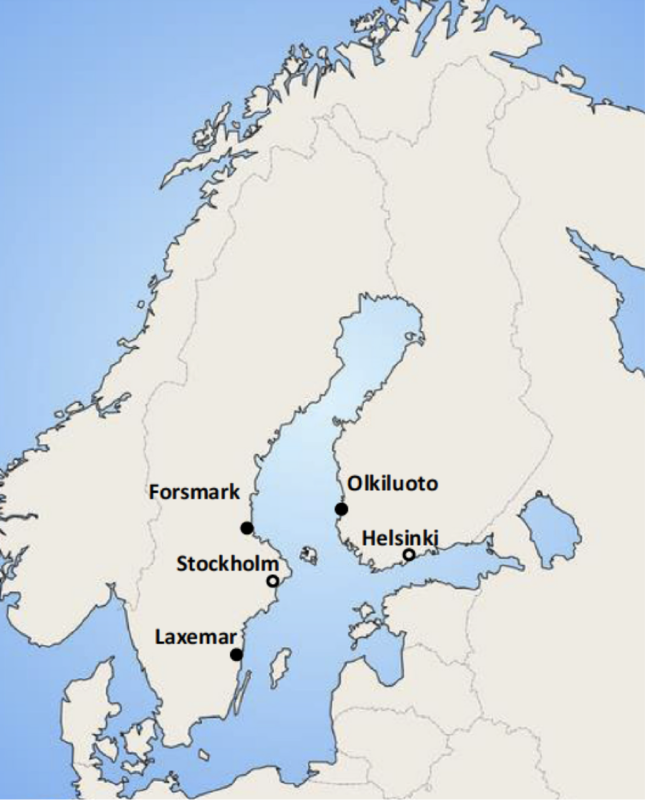 Understanding and modelling dissolved gas transport in the bedrockof three Fennoscandian sites. Journal of Hydrology, 512, 506–517. Andrews, J. 1(985). The isotopic composition of radiogenic helium and its use to study groundwater movement in confined aquifers. Chemical Geology 49, 339–351.